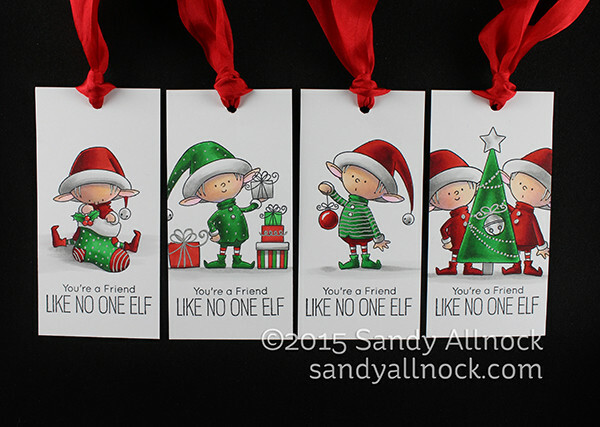 It’s day three of the 24 tags of Christmas series for 2015! You knew there’d be some traditional Copic, right? (Yesterday I colored Copic on wood – check that out HERE.) If you’d like to see last year’s day three tag, click HERE. Lots of folks want tips on shading of images….and since this adorable stamp set has a bunch of images in it, I thought it would be fun to color each one with the lighting from a different direction! Check out the video below, or click HERE to see it in HD on YouTube! Could this stamp set BE any cuter?? I’m going to be stamping a bunch to take home with me for Thanksgiving and coloring up a storm – love that I can use a limited palette – so just take a few markers and refills that work together!! woohoo! I love the way you explain lightthe elves are adorable. Make A Wish! Wow! I just love these elfs. Thanks for sharing the lighting techniques. I just love your work Sandy. I enjoy your videos so much, really inspires me. My charity is http://ww w.nevadacountypetsofthehomeless.com/, an organization dedicated to working with people and local organizations in our community to collect pet food and supplies for pets of the residents of Nevada County, CA. You are soooooo creative. I wish I had your creativity. Thank you again for your wonderful classes/samples. OOps! My favorite charity is Blue Star Mom’s Silicon Valley Chapter. 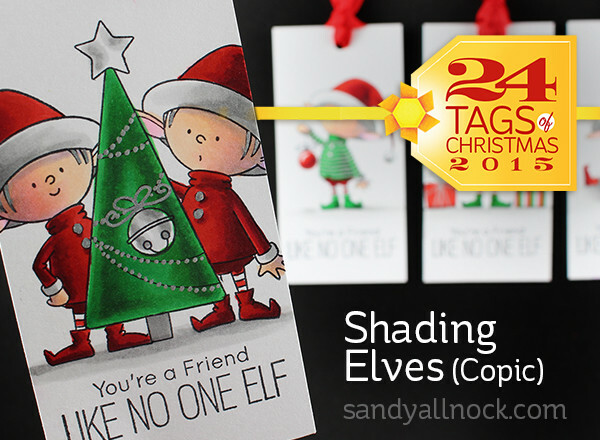 The elves are the first tags I have seen…adorable …and I love the different light sources you demonstrated. I am excited to see more of the tags. My favorite charity would be Baltimore Rescue Mission or a charity that supports families trying to adopt children. Thanks for the chance to win one of these beautiful tags. Once again I’ve learned so much from one video! I wish my high school art teacher could see that I finally ‘get’ shadows and lighting, although she might be concerned that I didn’t learn it from her! I think you take artistic theory/concepts and describe so that even the not-as-arty among us can understand. Thank you for that. The silver pen touches at the very end really do take the pieces to the next level. Thanks also for the R89 and R37 suggestions. I’ve got them on the my wishlist now.